Pia Y Damaso is a restaurant with a quaint old-world feel right in the heart of Makati. 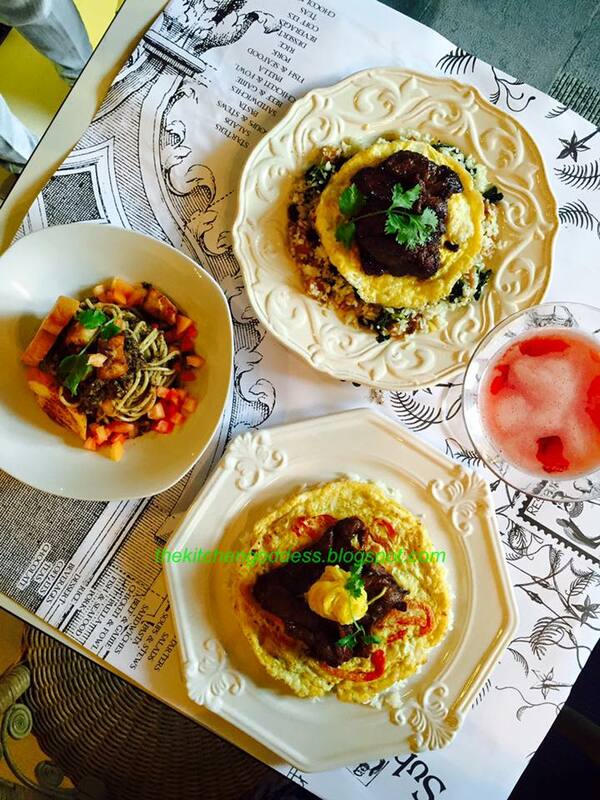 The dishes are inspired from the pages of Jose Rizal's Noli Me Tangere and El Filibusterismo. I find it nice that there's a restaurant wherein you can reminisce about reading Rizal's famous novels aside from just talking about how good the food is. Tuna Egg Bihod, Tapenade and Marlin Pasta, P360. 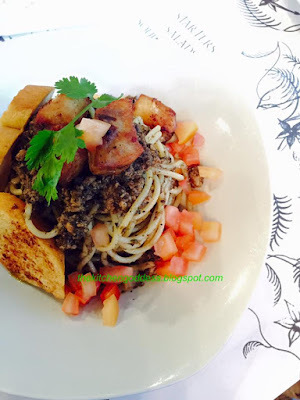 I love pasta or anything with noodles so this dish is already a winner for me. I find it interesting that the sauce made use of bihod or fish roe and the flavors blended well with the chopped tomatoes and the marlin. I'd recommend this for the seafood lovers and those craving for something new. Crispy Boneless Pork, P350. 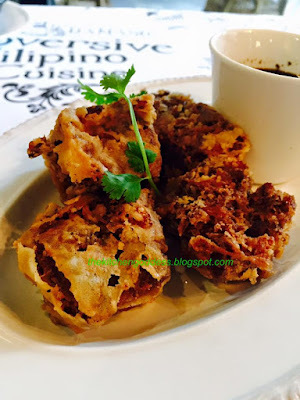 Crispy pata cubes! Really, no kidding. Hard not to fall in love with its crispiness. The dipping sauce with vinegar lessens the guilty feelings of feasting on this cholesterific dish. Yum! Lang Lang, P325. 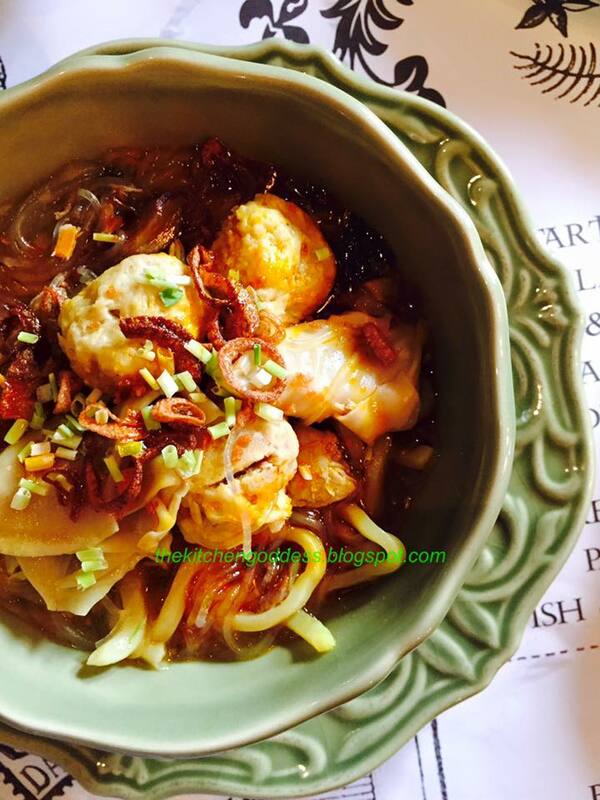 This is an old comfort favorite made with chicken, ham, mushrooms, sotanghon, lomi, and pancit molo. Perfect on rainy days or those days wherein nostalgia sets in. Smoked Tapang Usa, P450. 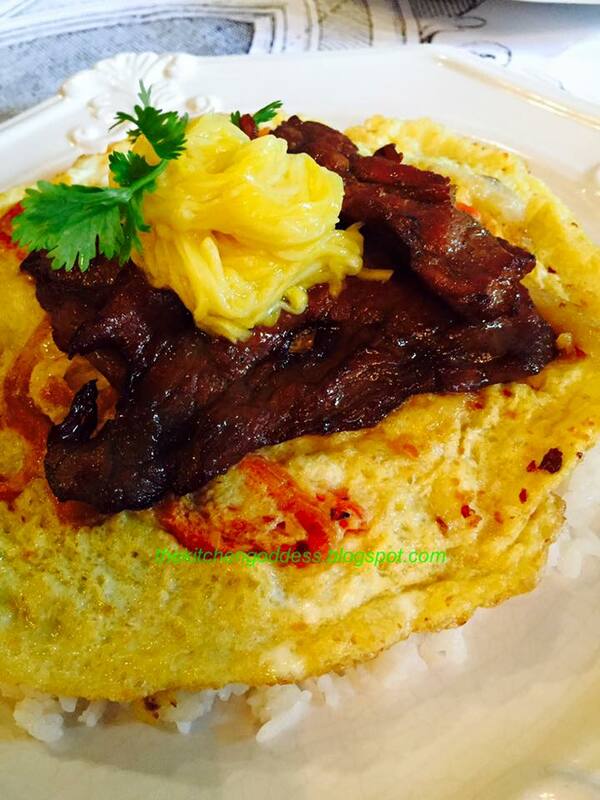 Expect to eat more than your usual portion of rice with this smoked tapang usa. An exotic all day breakfast favorite. The meat is tender and flavorful. No need for vinegar although you can request if you like. I'd love to pair this with achara though. Croque Monja, P280. For merienda, this cheesy tinapa grilled sandwich is a must-try at Pia Y Damaso. I'm not really fond of tinapa but they've perfected the combination of cheese and tinapa that eating this doesn't make me think of tinapa... hehe. And did I say that they used Goat Cheese? Thumbs up! Sisig ni Cabesang Tales. 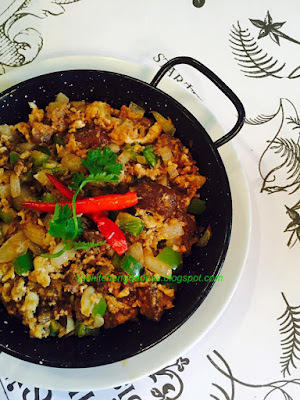 Who doesn't love sisig? This is just as popular as adobo. 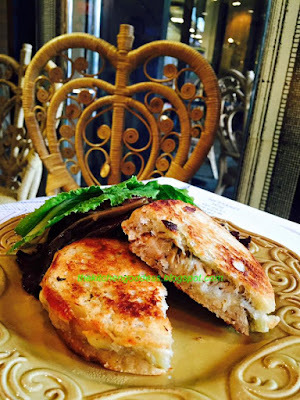 Perfect with wine especially if you are in for a romantic night with your sweetheart. Chinese Lumpia Salad, P275. I'm saving the best for last. This is the dish that I really really like at Pia Y Damaso. Its a plateful version of our beloved Chinese lumpia, the one with wansoy, peanuts, sugar, and lots and lots of garlic. And instead of a lumpia wrapper, it rests on a bed of lettuce. The restaurant also serves mouthwatering desserts. Read more here. Been eyeing to try this resto. Thanks for sharing! Lang lang! It's been ages since I last tasted that dish. Nostalgic indeed - now I am craving! How very interesting that these dishes are based on JR's novels. May look into this for a dining trip with the kids. I'm intrigued with Sisig ni Cabesang Tales. 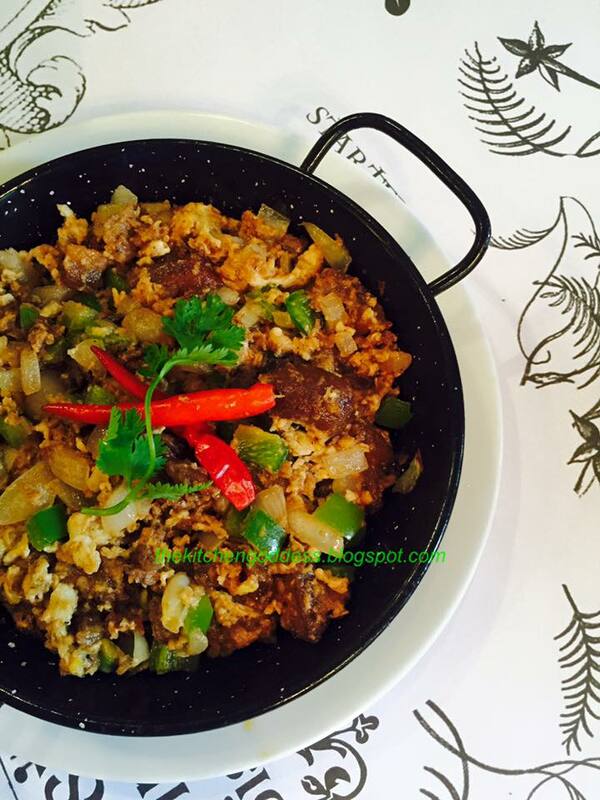 Hubby and I both love sisig, so this is something we would like to try. i've eaten here before. they have awesome dishes! the lumpia is super yummy! I agree with the lumpia. Its lumpia made sosyal but the taste --- just, wow! Croque Monja and Smoked Tapang Usa for the win! If we have extra budget for a not so ordinary dinner, we'll go to this restaurant. Thanks for sharing! 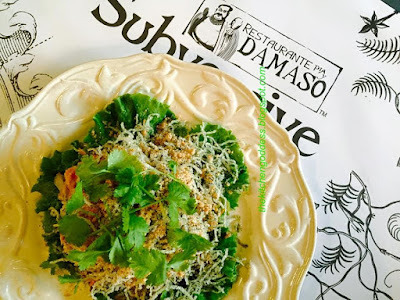 Is the owner of Pia Y Damaso same as the owner of Crisostomo?